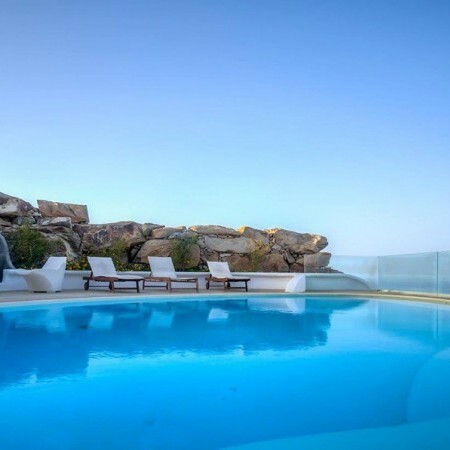 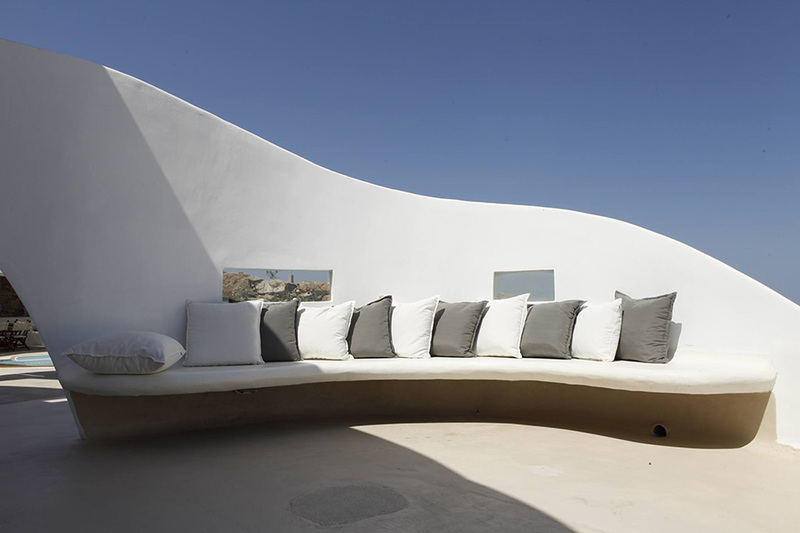 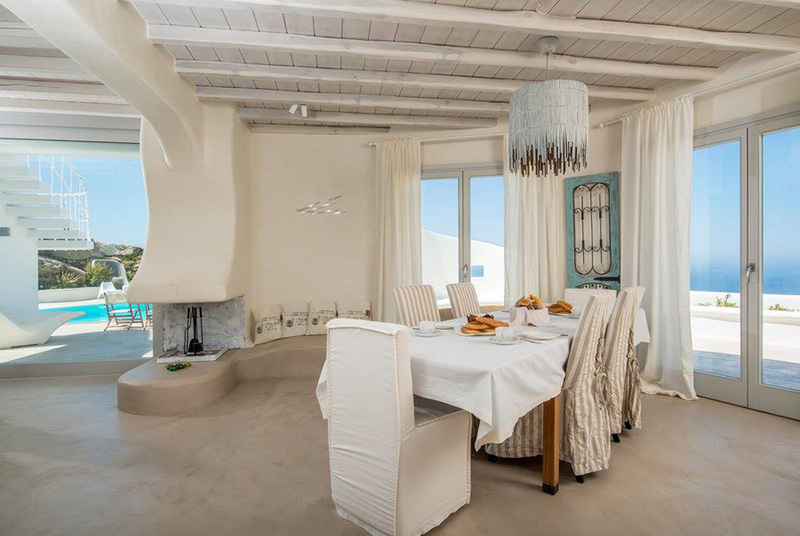 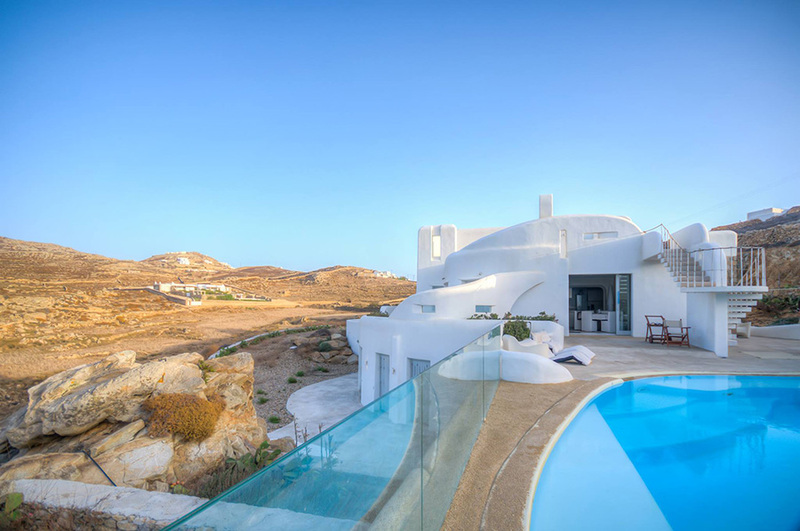 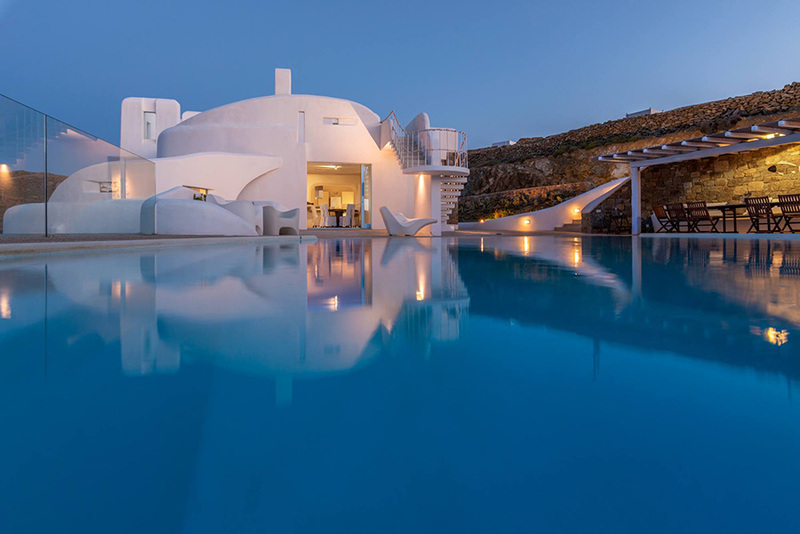 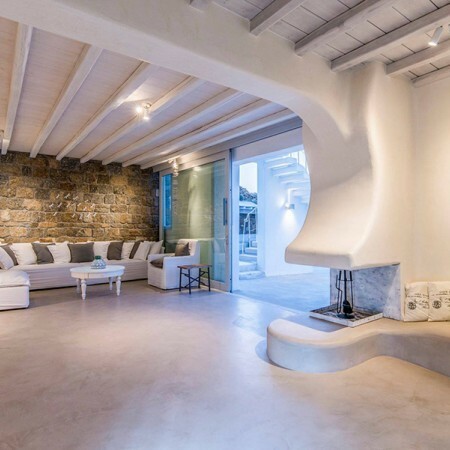 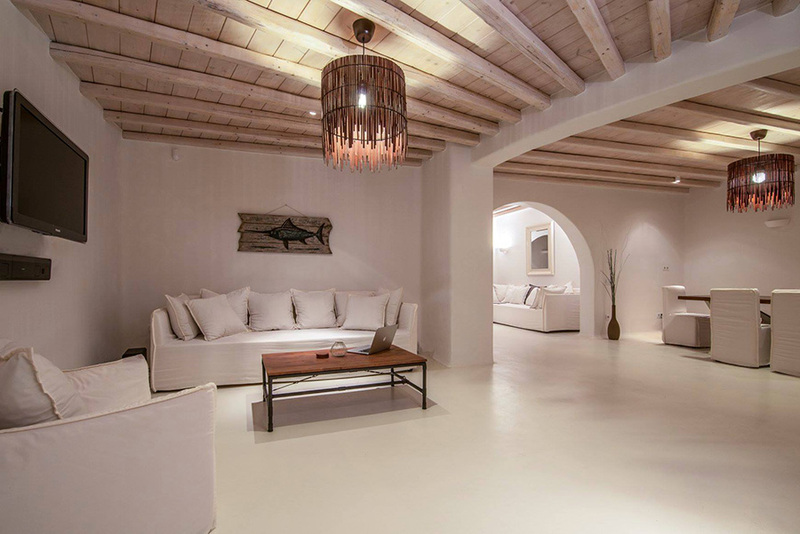 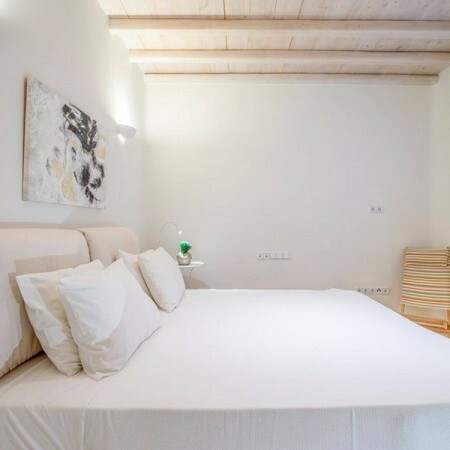 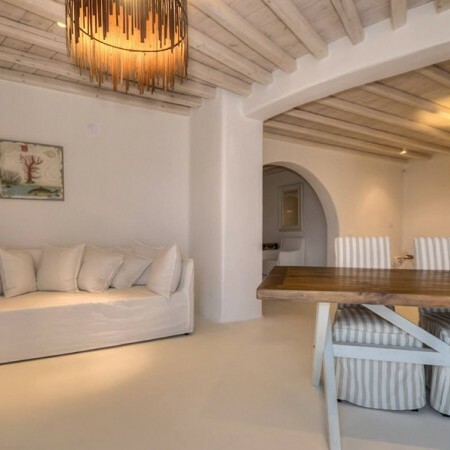 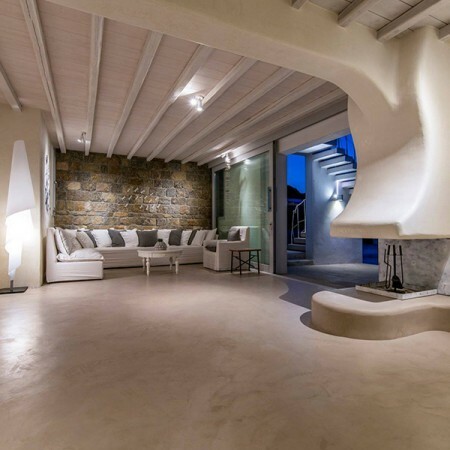 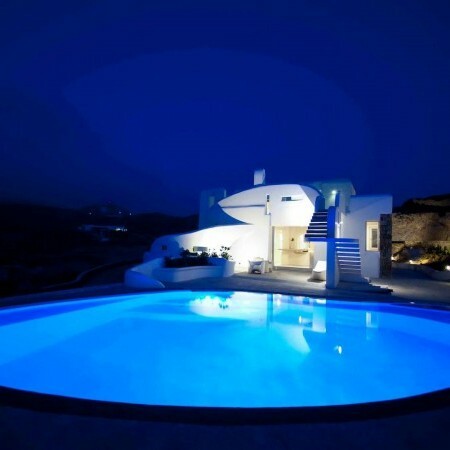 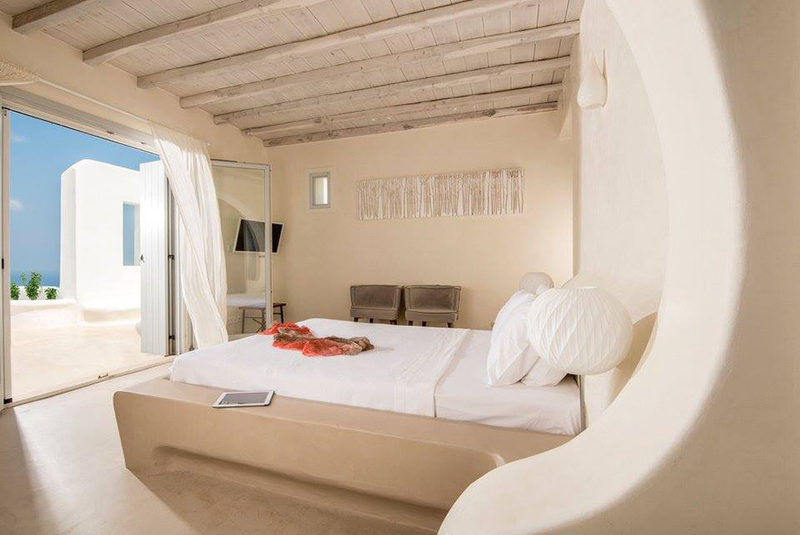 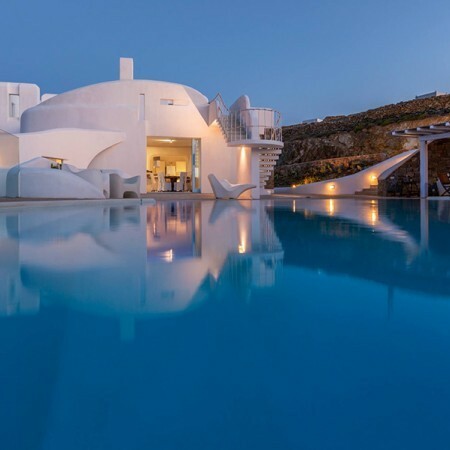 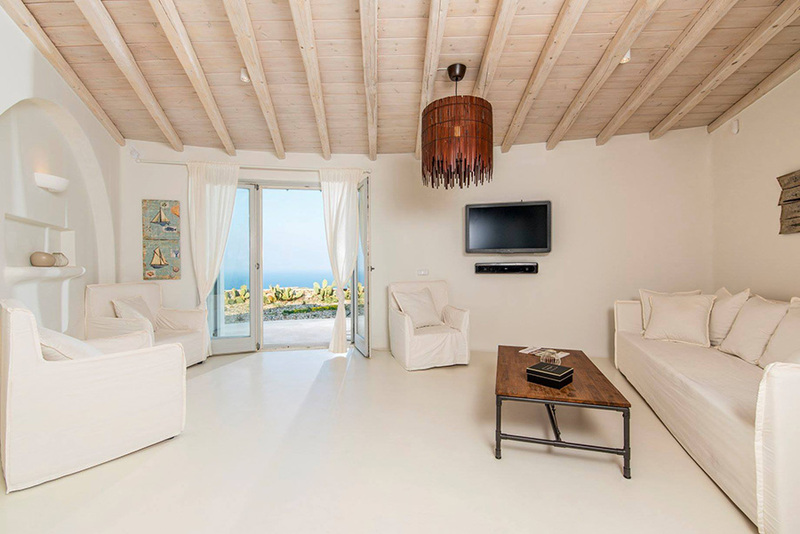 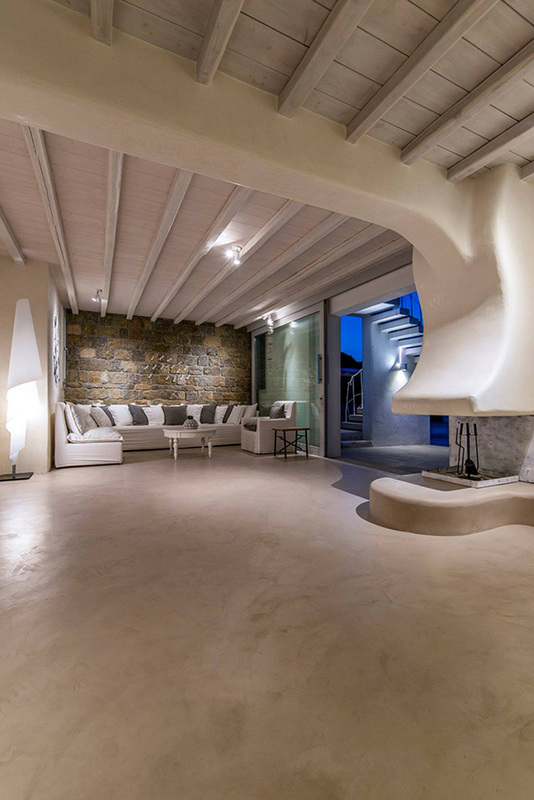 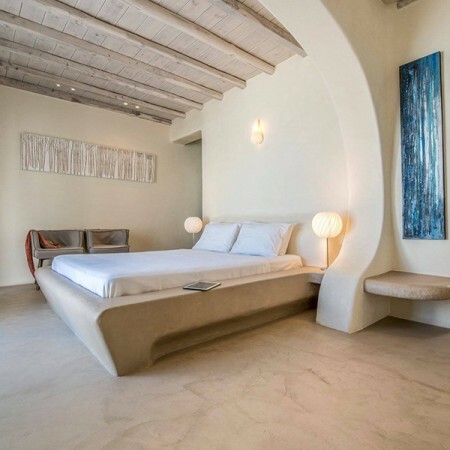 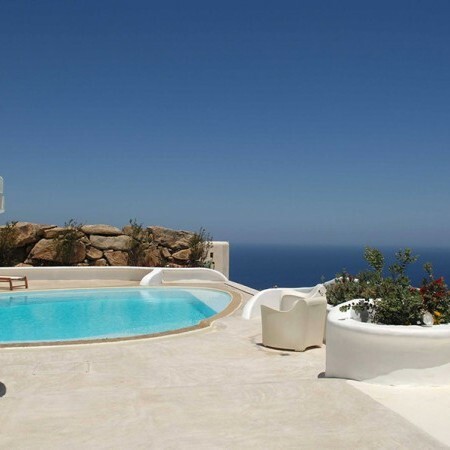 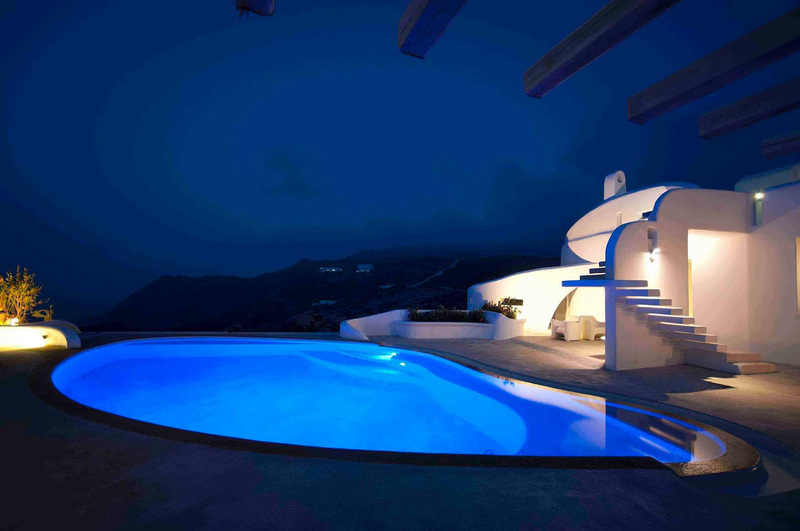 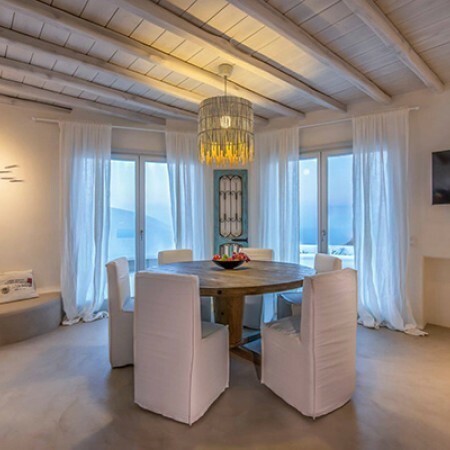 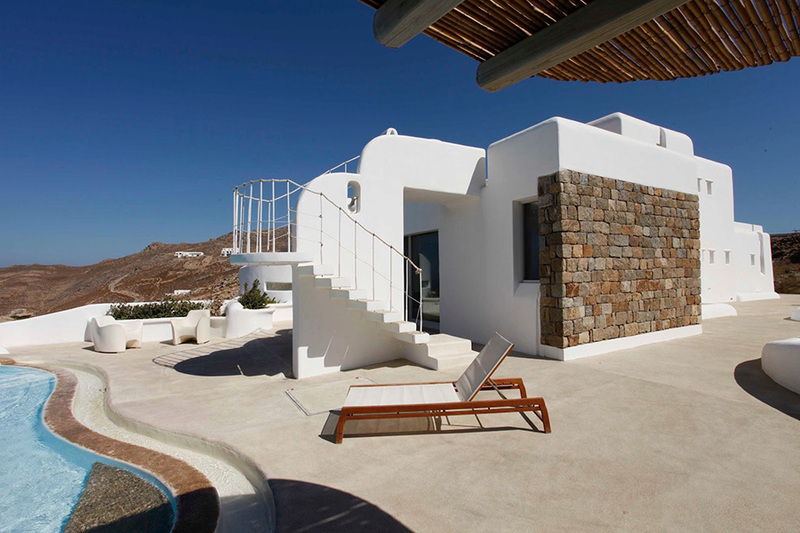 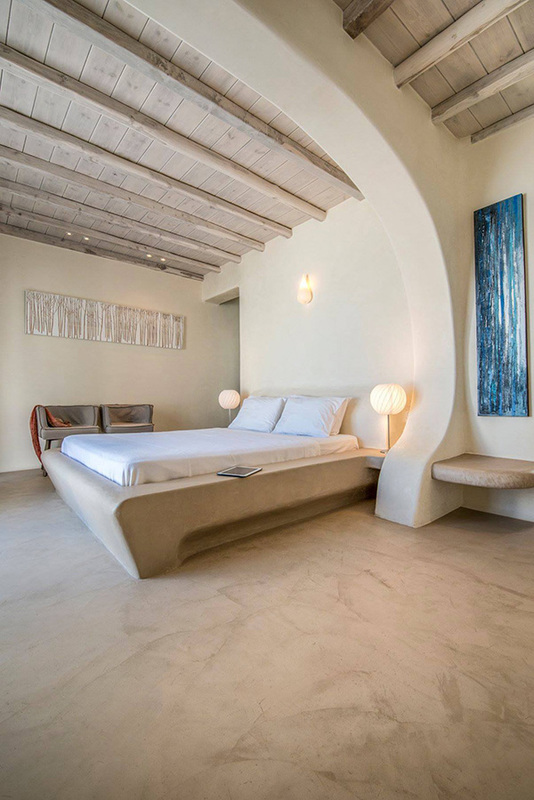 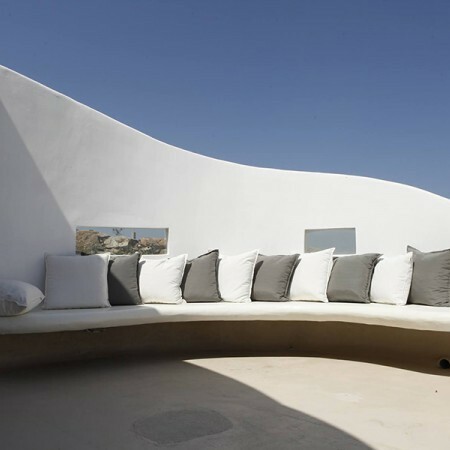 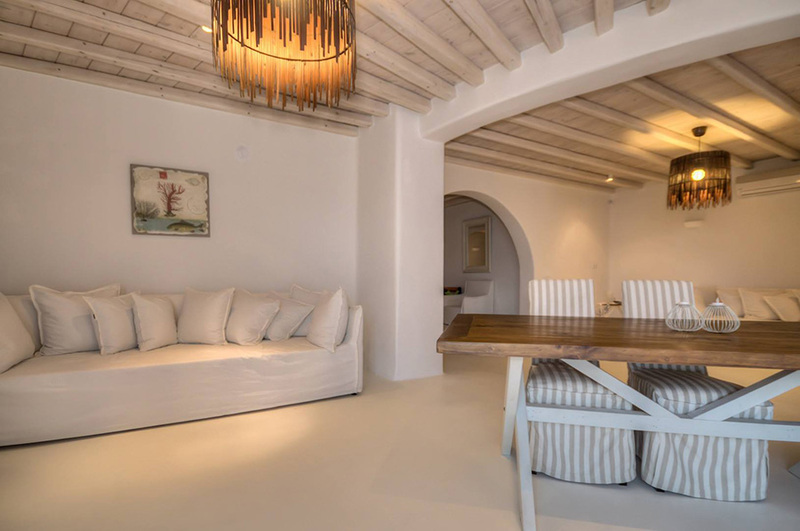 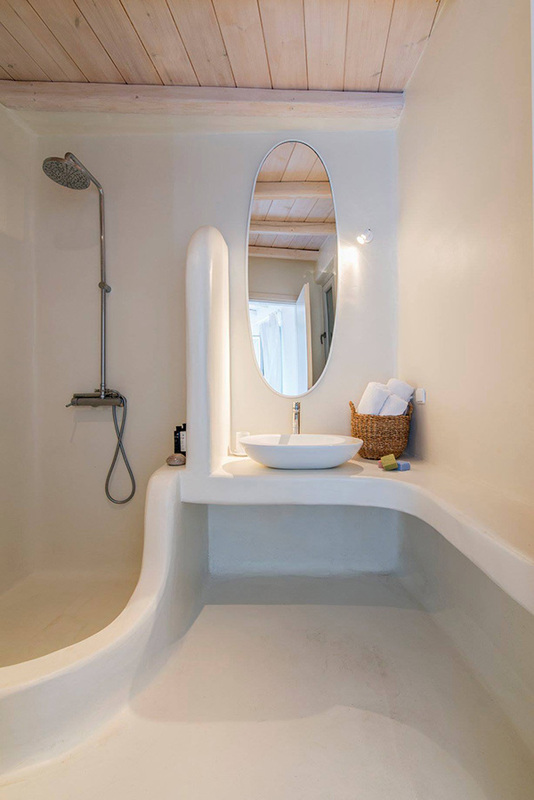 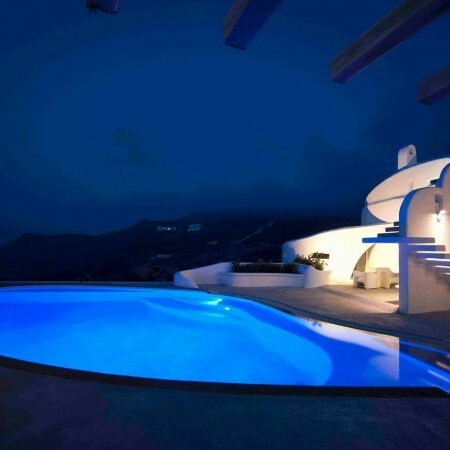 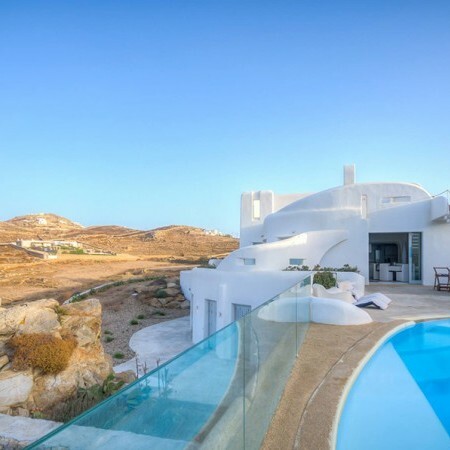 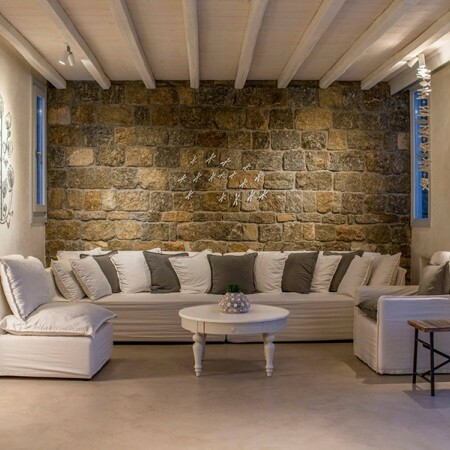 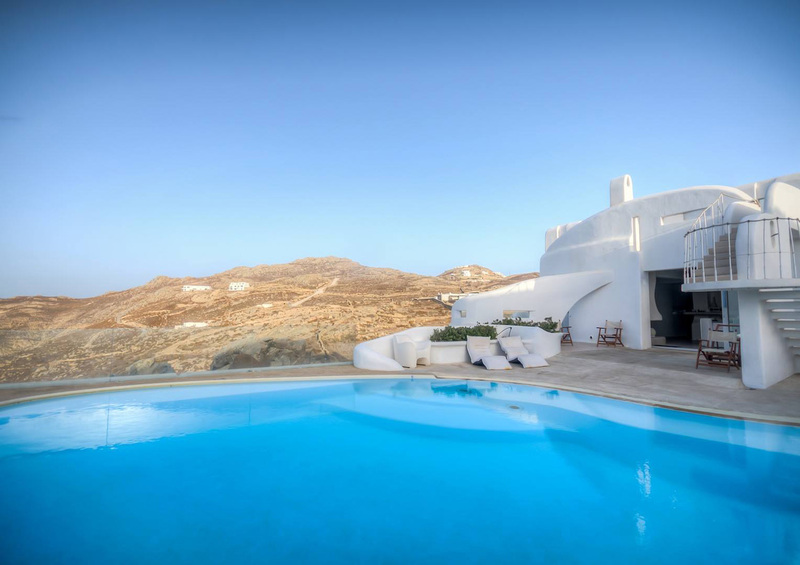 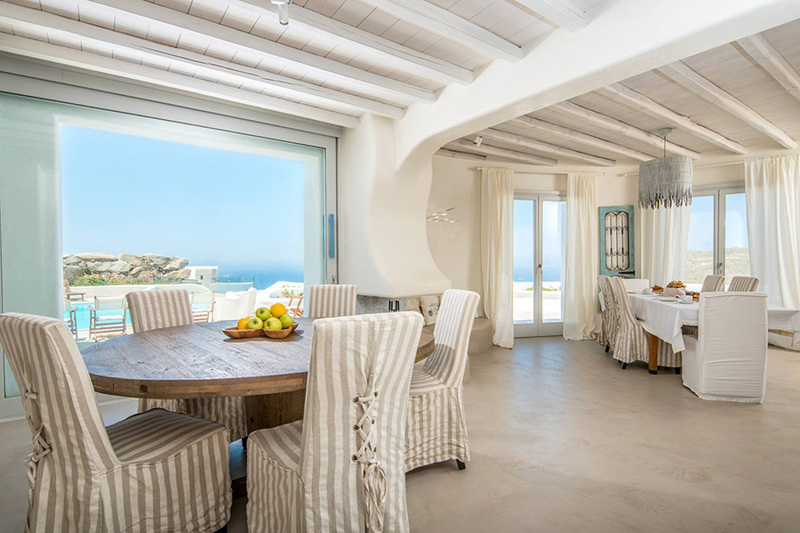 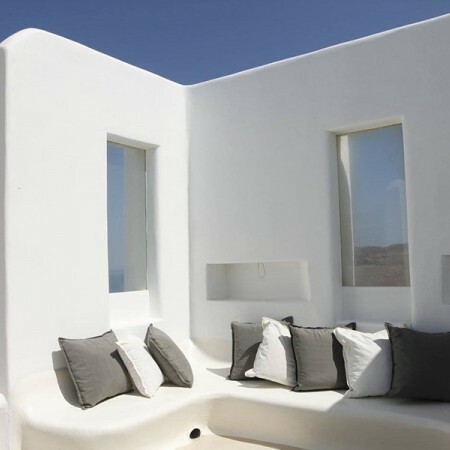 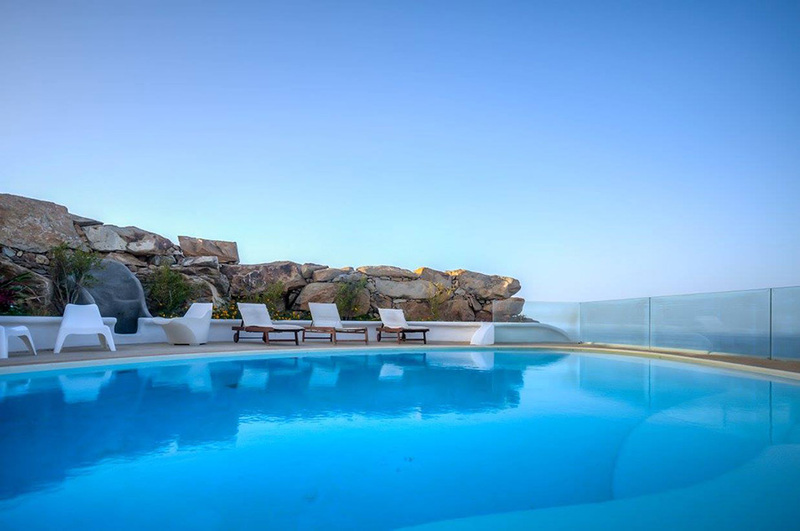 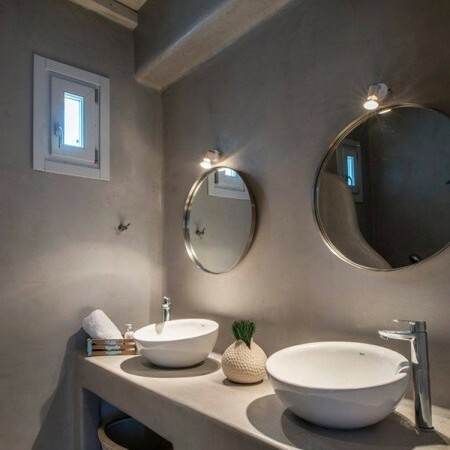 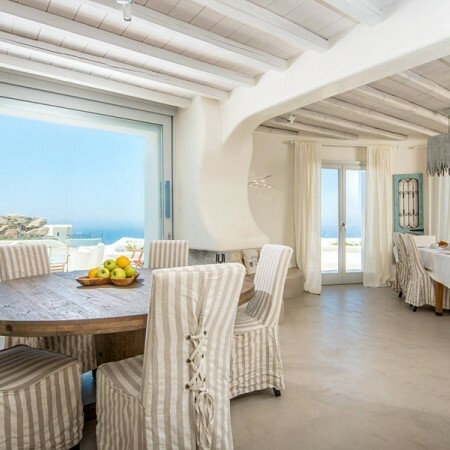 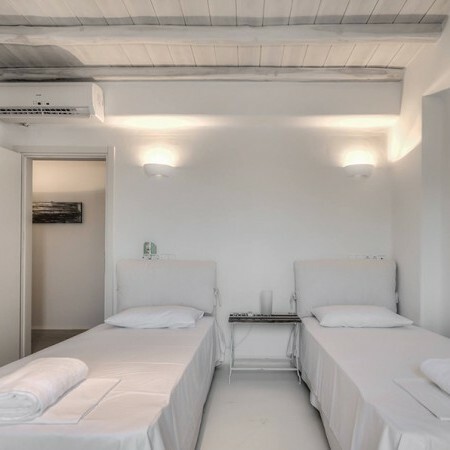 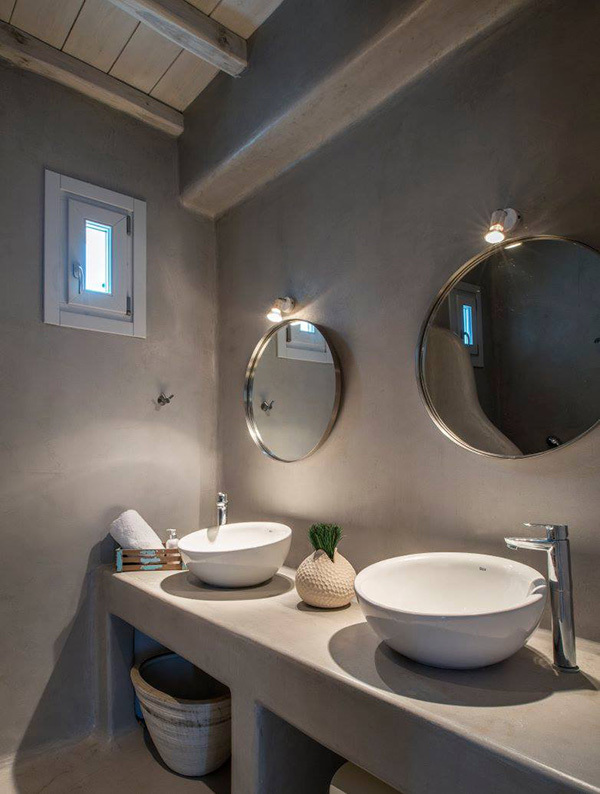 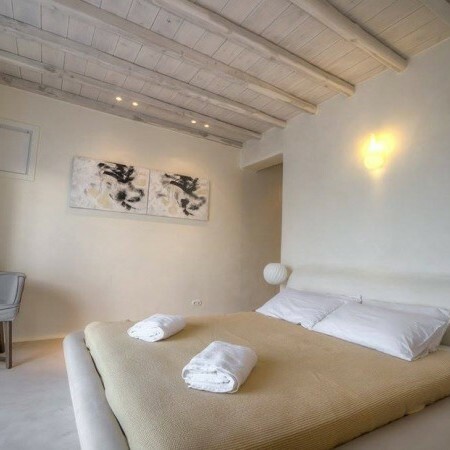 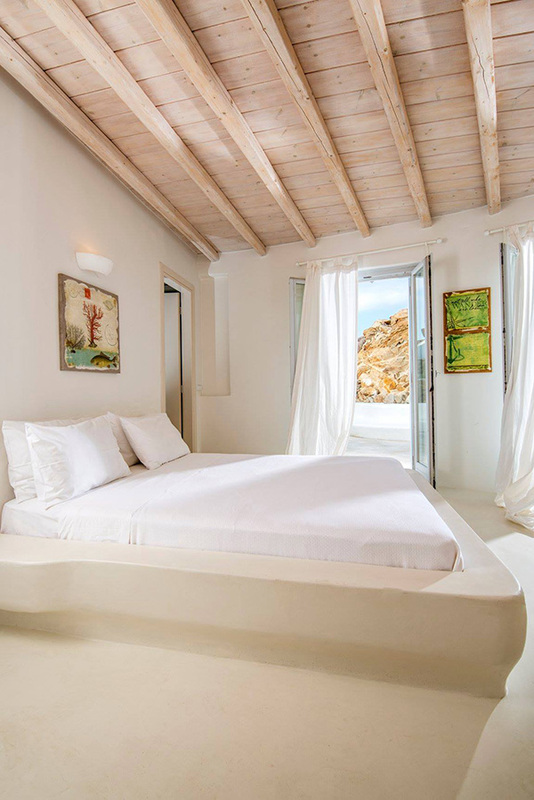 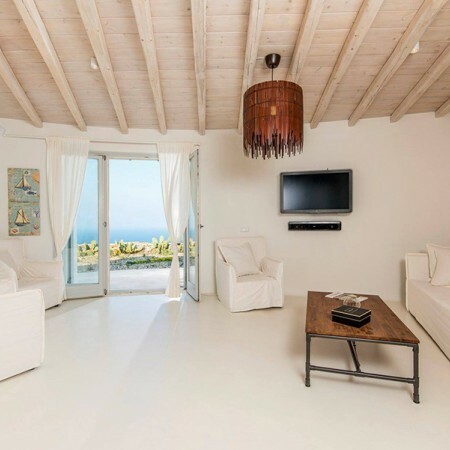 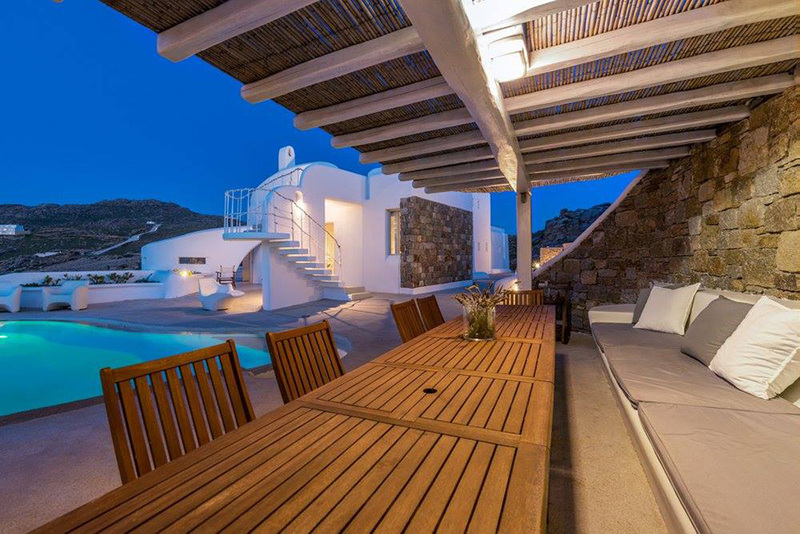 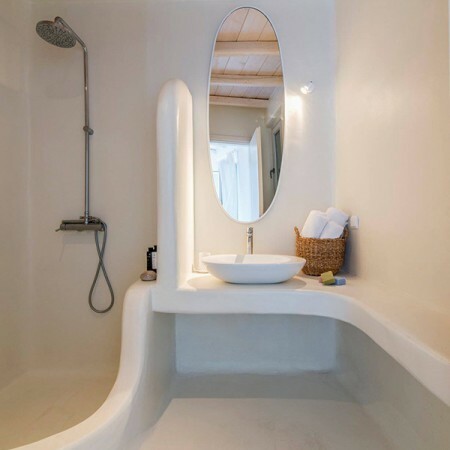 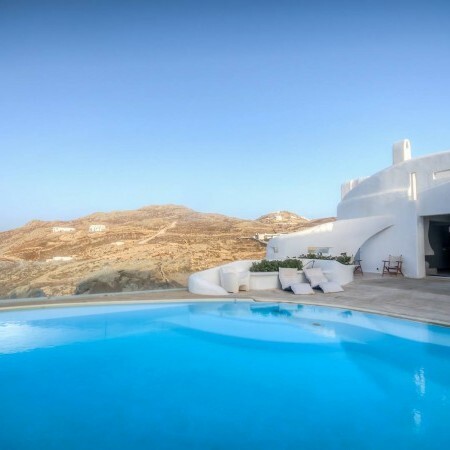 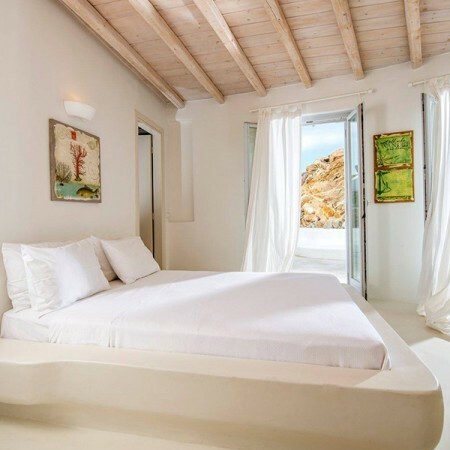 Villa Nissi is a magnificent villa for rent in Mykonos, built in 2013 in a beautiful location at just a 10' drive from Mykonos town. 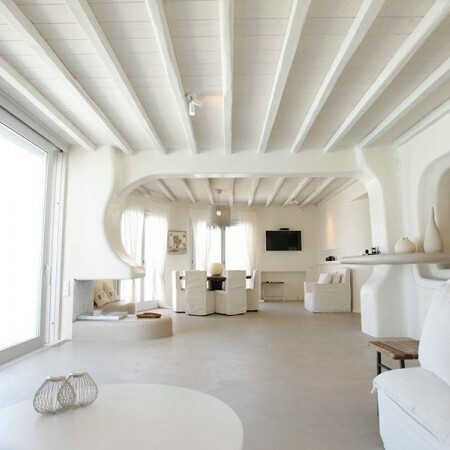 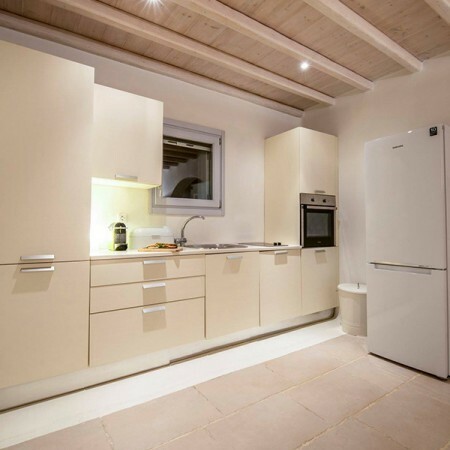 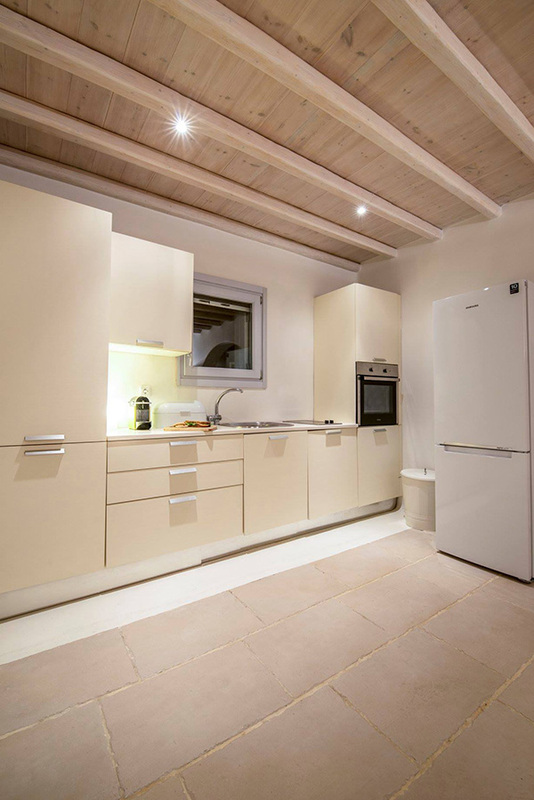 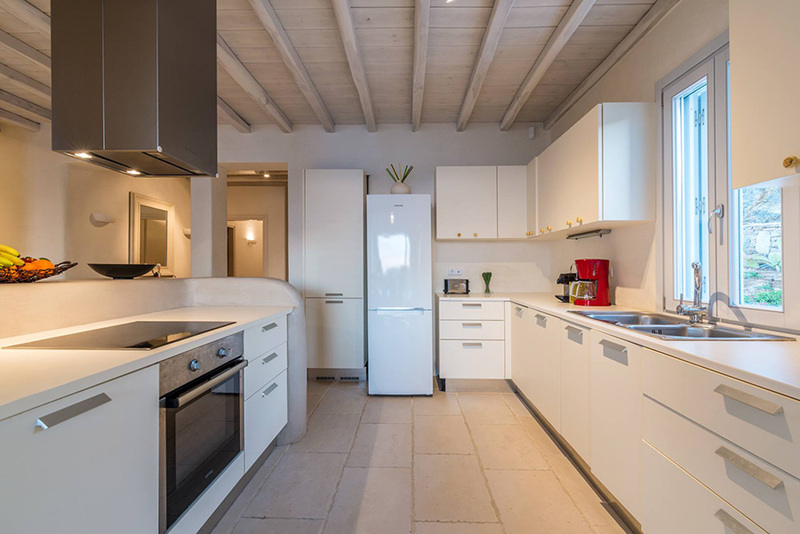 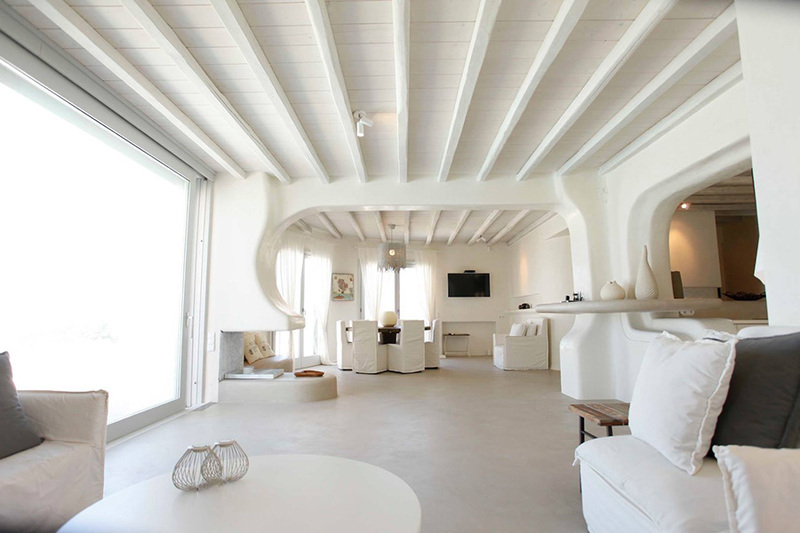 The villa is covering 480m2 in a beautiful plot of 4.000m2. 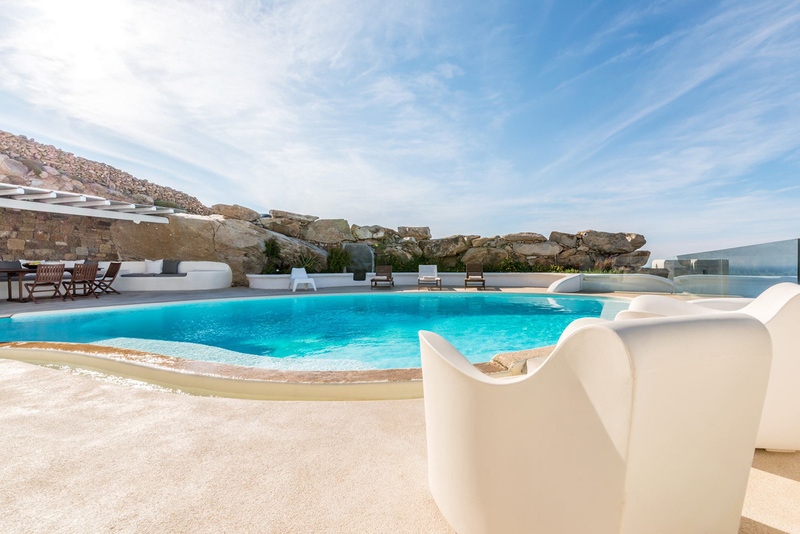 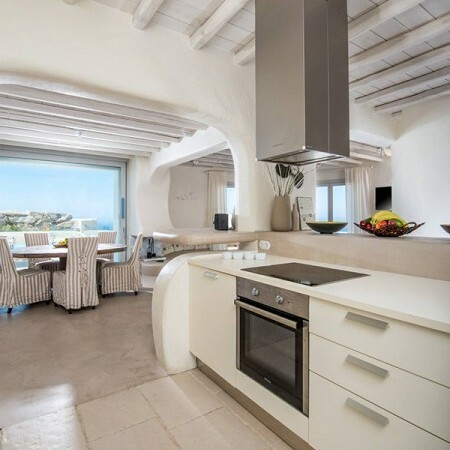 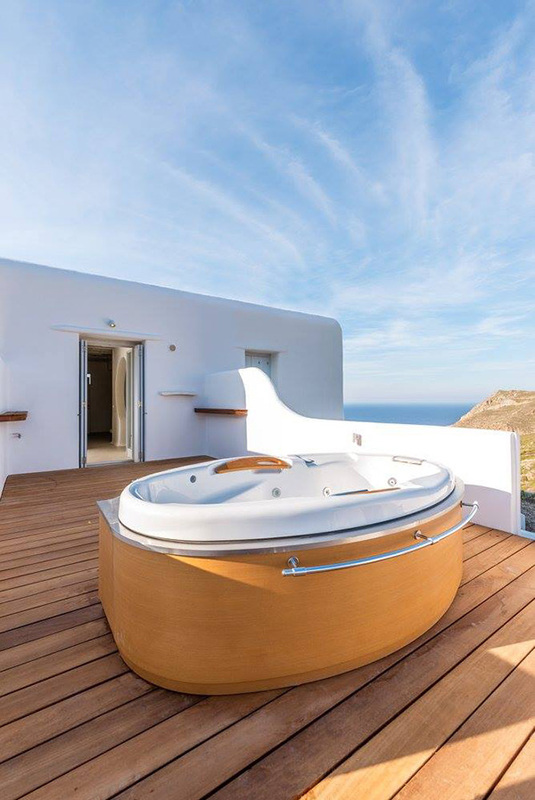 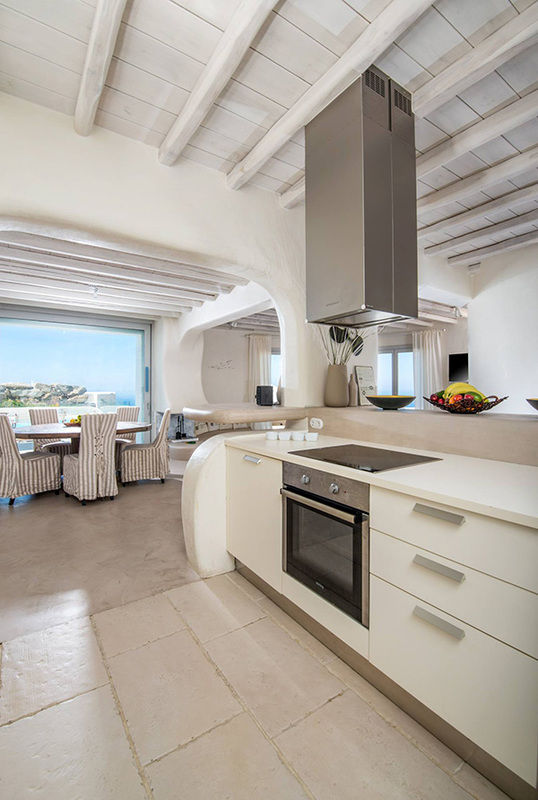 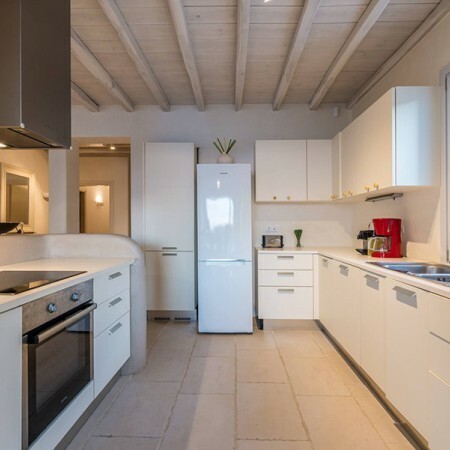 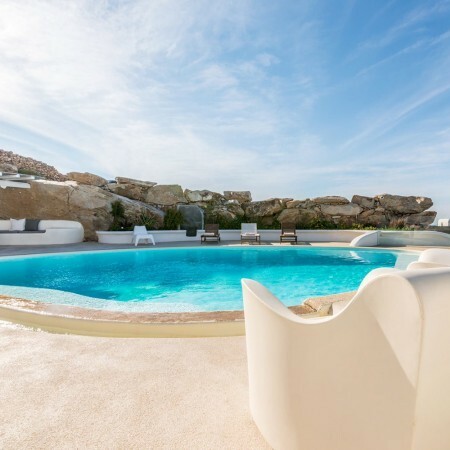 A luxurious residence with a 68m2 pool that is well developed in three distinct levels and comfortably accommodates 18 pax , Villa Nissi is an exquisite choice for a relaxing vacation with your family or friends! 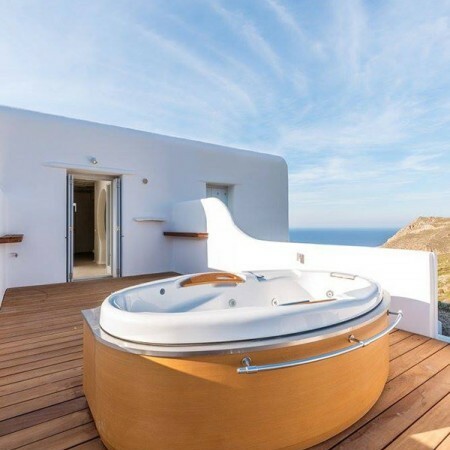 Guests have easy access on the premises. 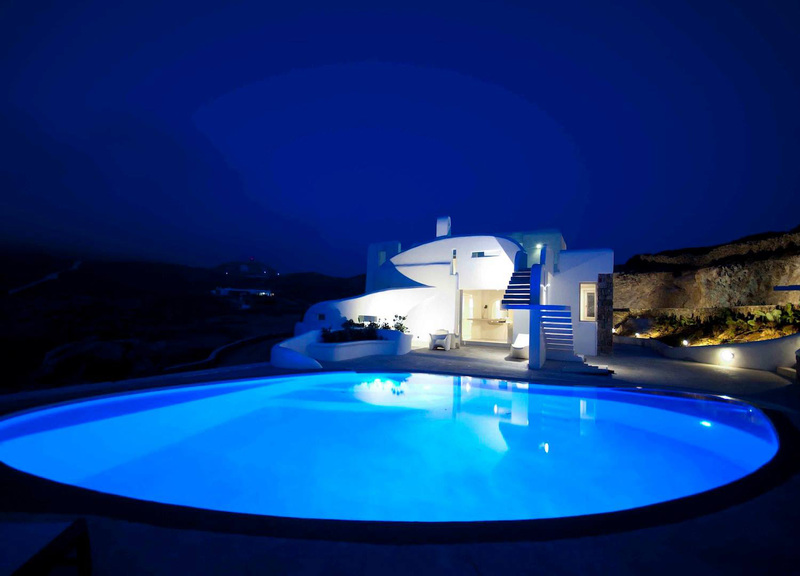 All house areas and pool are private and there are no shared areas by other guests. 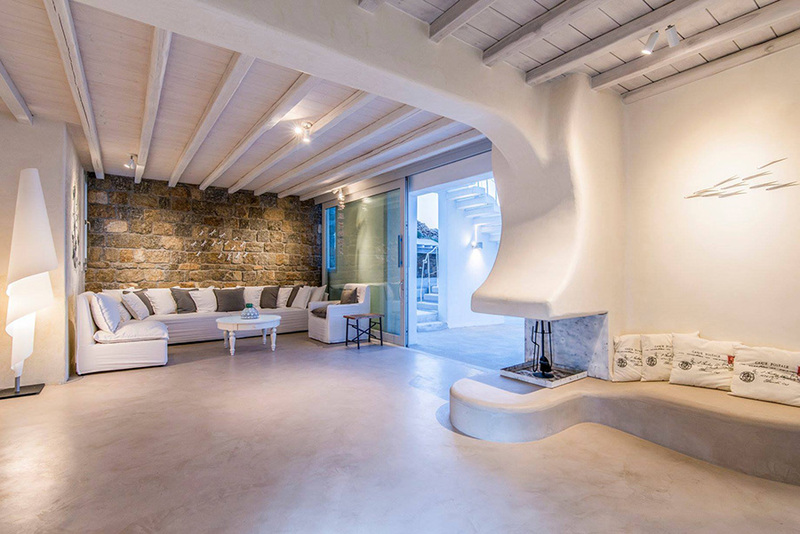 Ground and first floor can keep separate entrances, with the first offering handicap access. 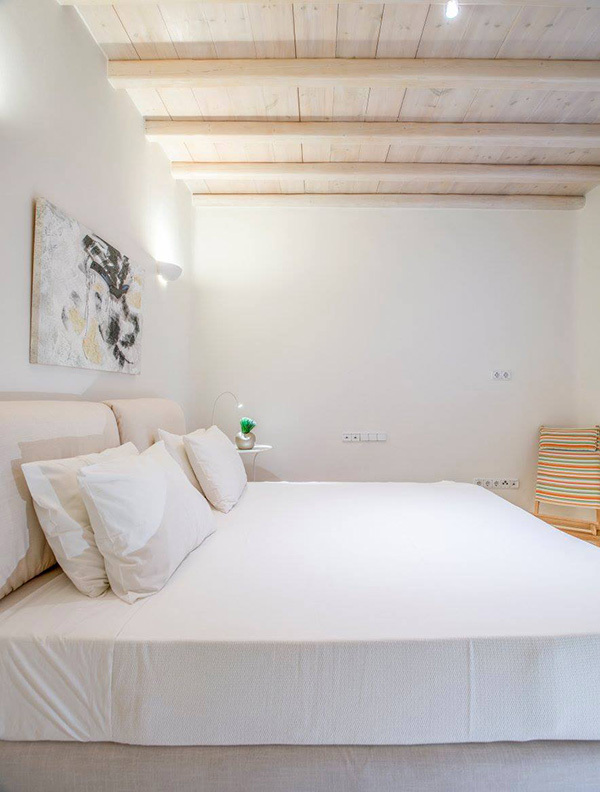 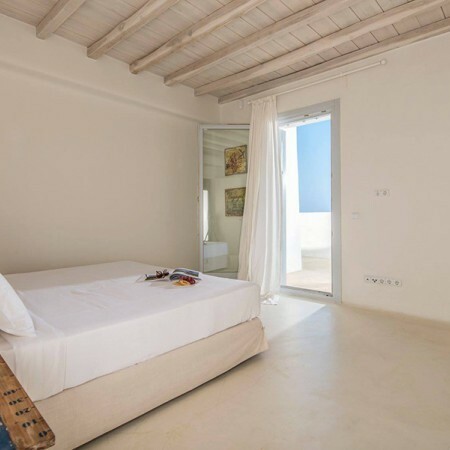 This exclusive villa has 9 spacious bedrooms that offer the option of two queen or one double king size bed to ensure a comfortable accommodation. 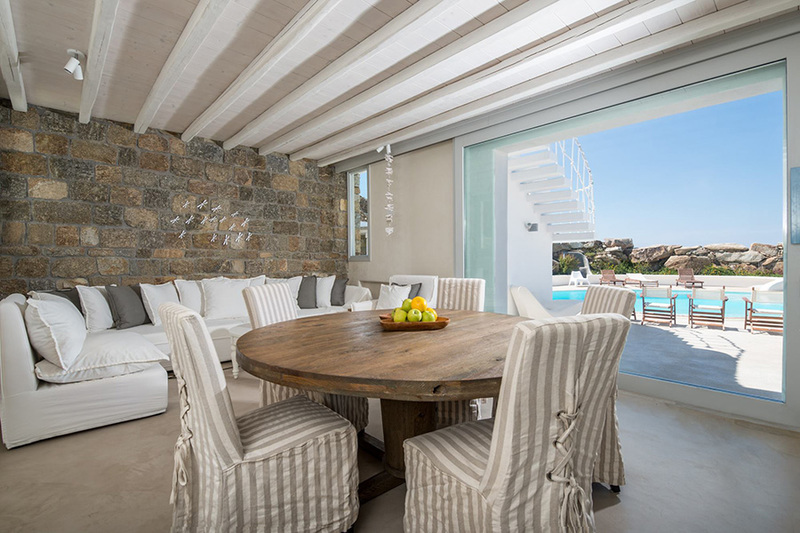 Level A provides an open plan living, dining and kitchen space with direct access to the outdoor areas. 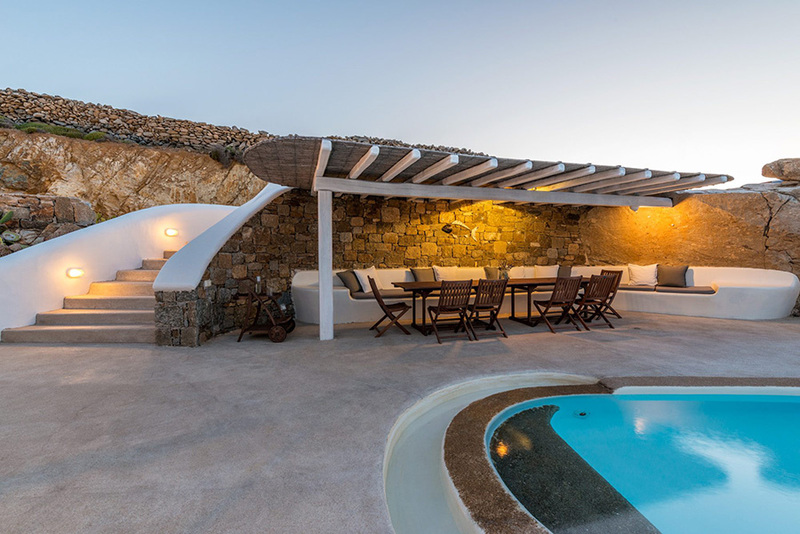 Outdoor areas and gardens are enhanced and supported by built seating zones, artfully integrated in the rocky landscape and orientated to panoramic sea views. 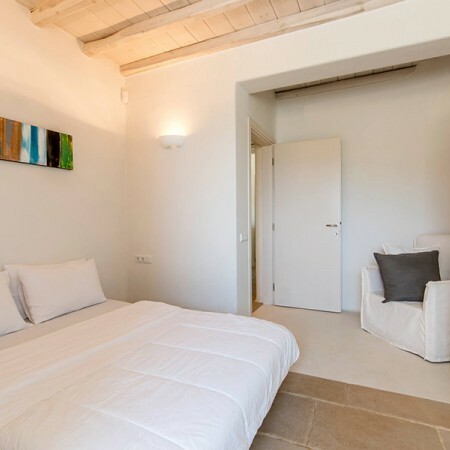 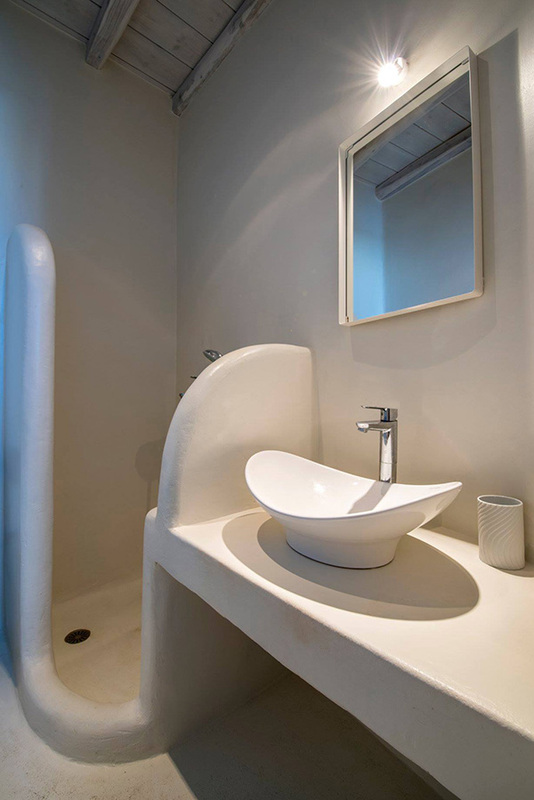 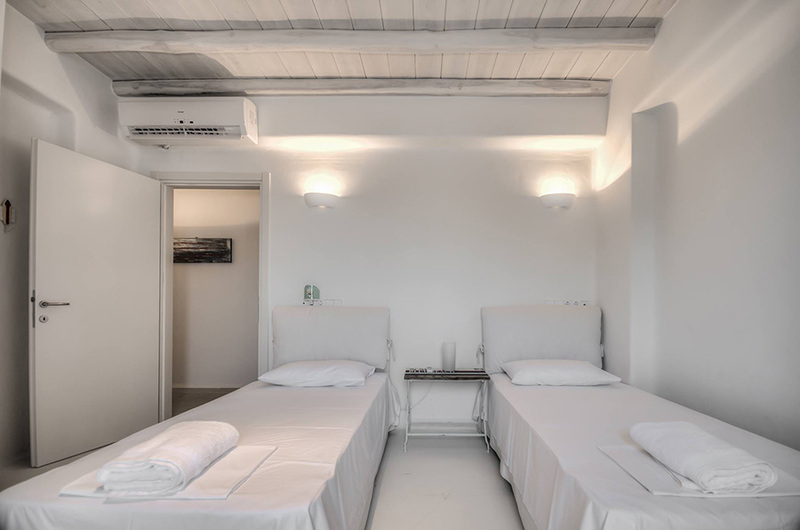 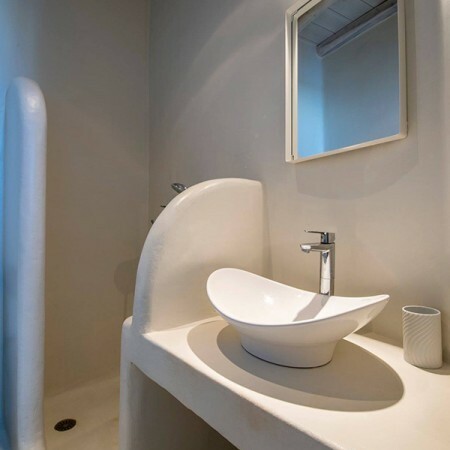 It has three comfortable en-suite bedrooms, one master bedroom with en-suite bathroom and dressing room that offers direct access to the outdoor seating area. 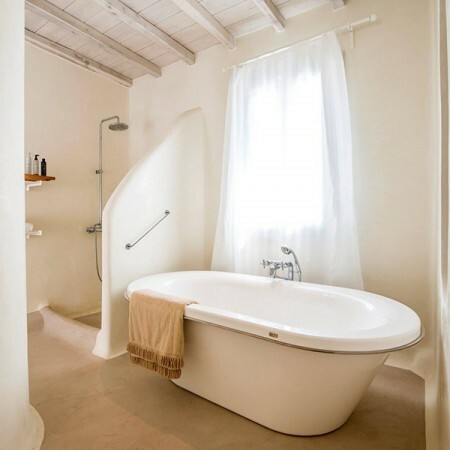 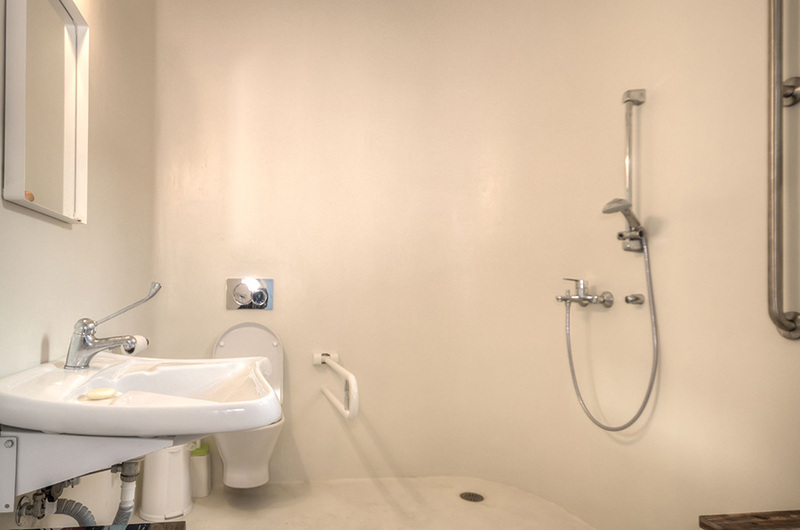 Moreover, there is a WC and a laundry room. 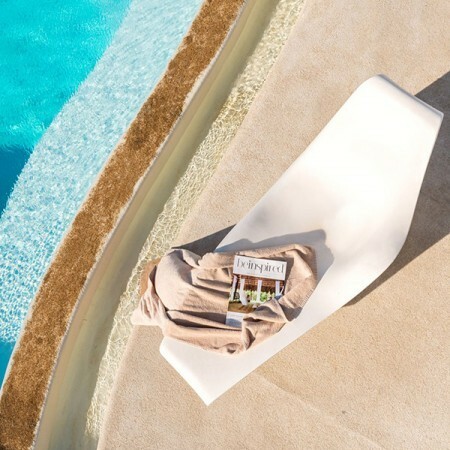 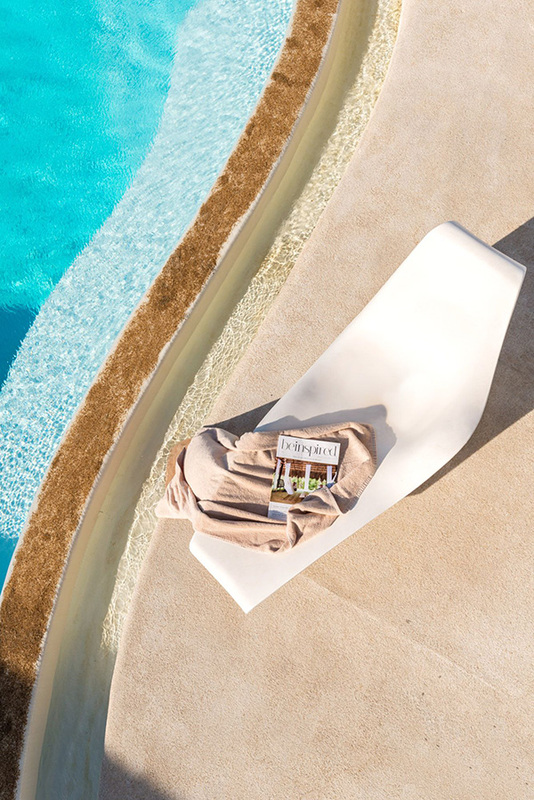 On the next level B is the beautiful terrace with the generous pergola-shaded seating area and the beautiful pool. 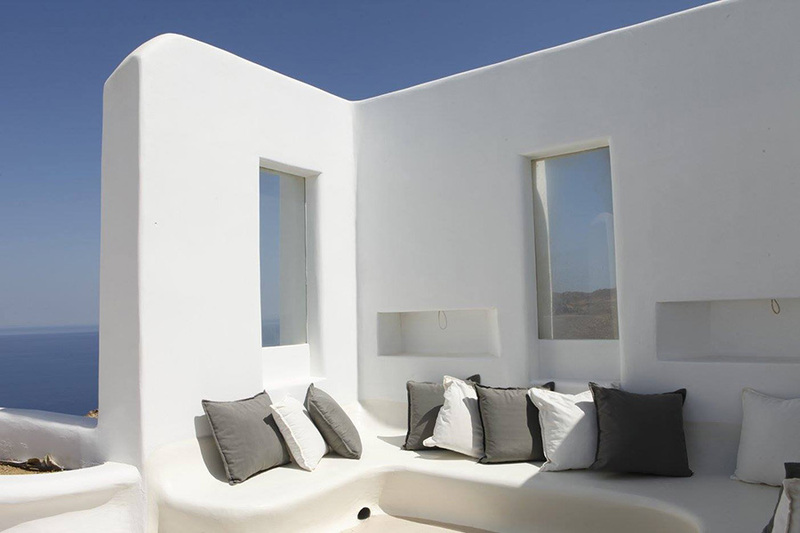 It is a wonderful place to chill out with a book, cradled by the sound of the sea. 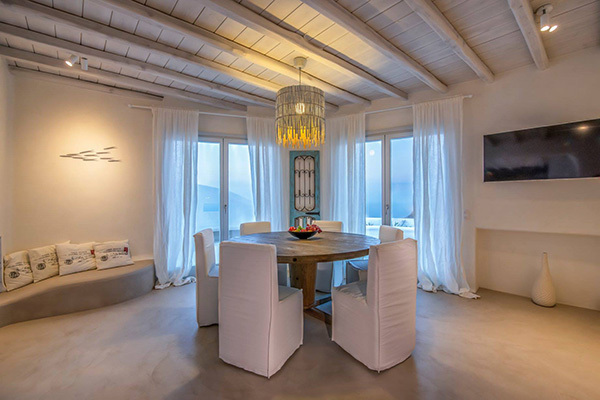 A perfect place to enjoy a romantic dinner or lunch. 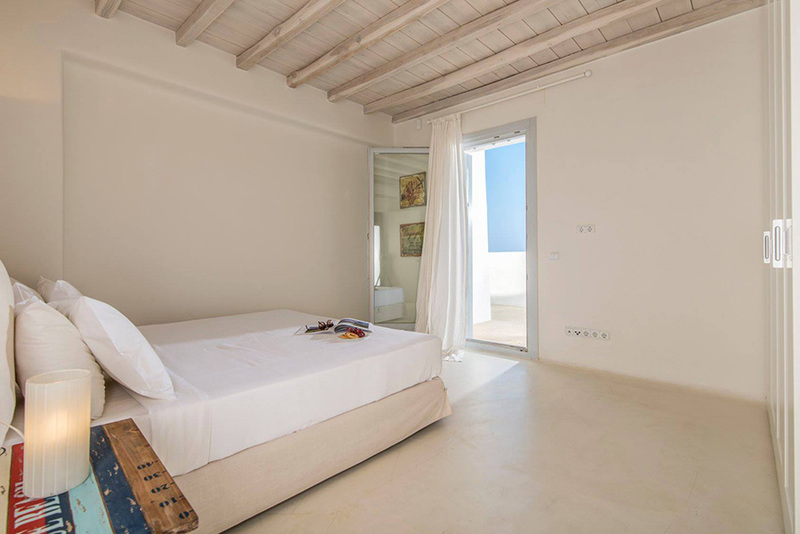 On that level you can also find two comfortable deluxe bedrooms, one en-suite master bedroom with direct access to the swimming pool area and an open plan living, dining and kitchen space with direct access to the swimming pool as well. 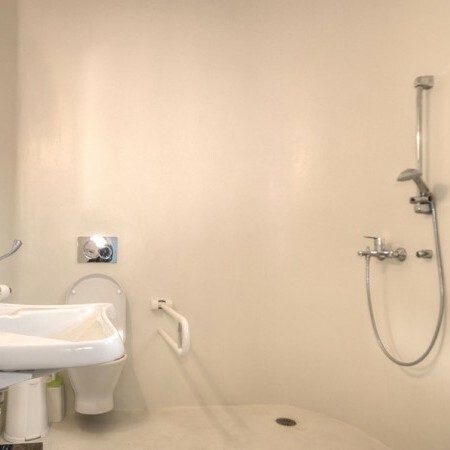 One spacious en suite bedroom/guestroom with a separate entrance designed to ensure access and comfort to disabled persons. 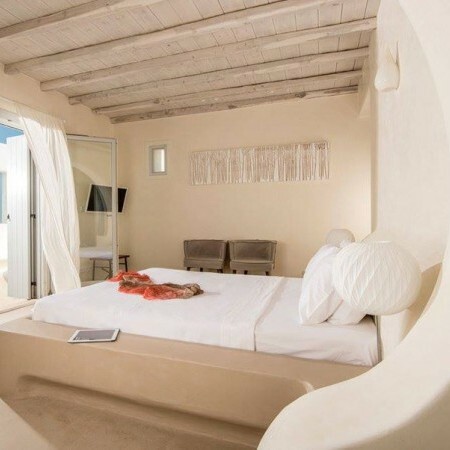 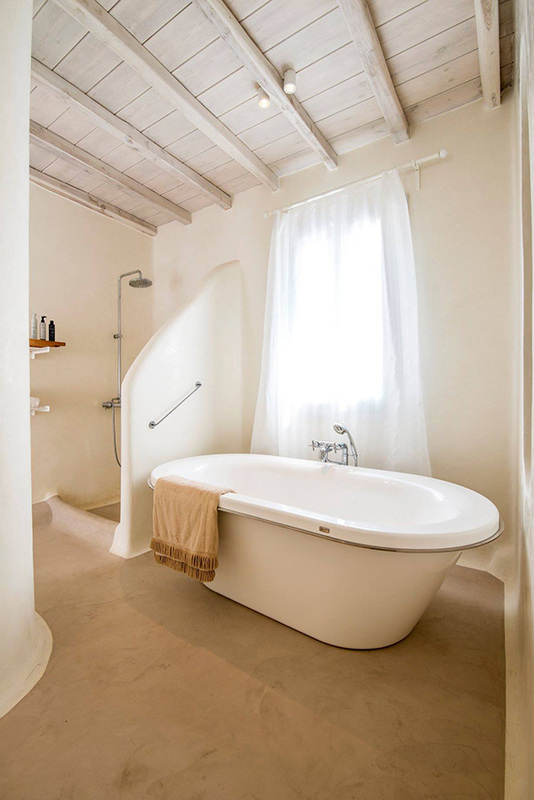 Finally, on the level C there is one comfortable en-suite master bedroom with walking closet, privileged with direct access to the swimming pool and the open seating area through an external staircase. 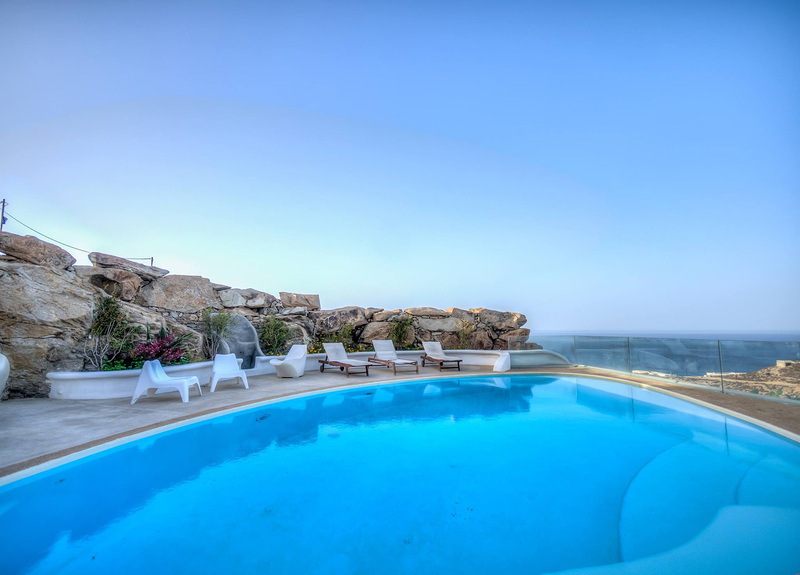 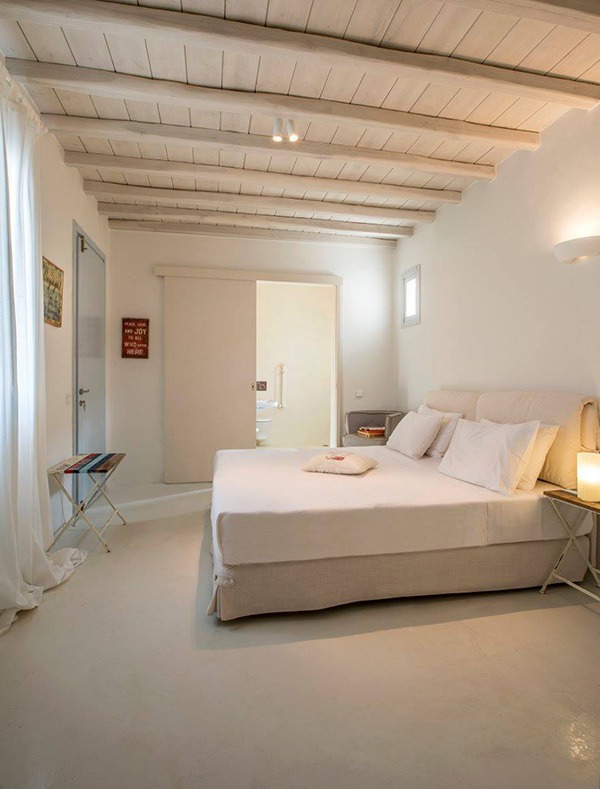 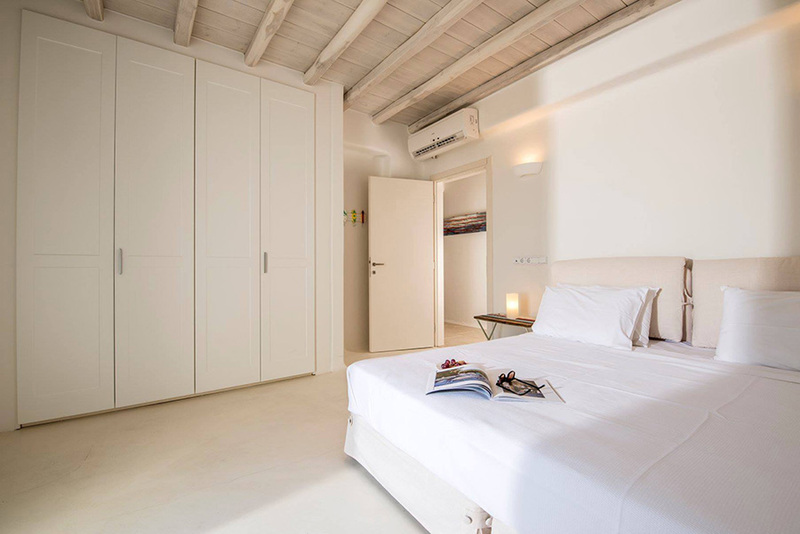 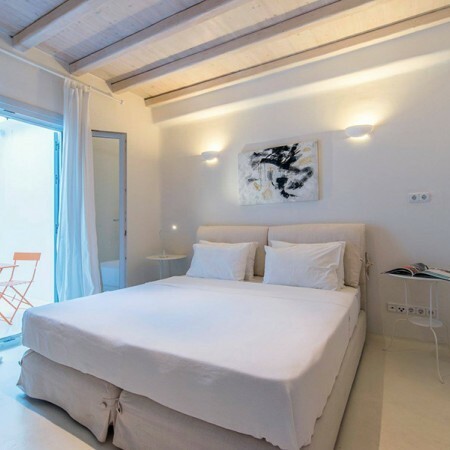 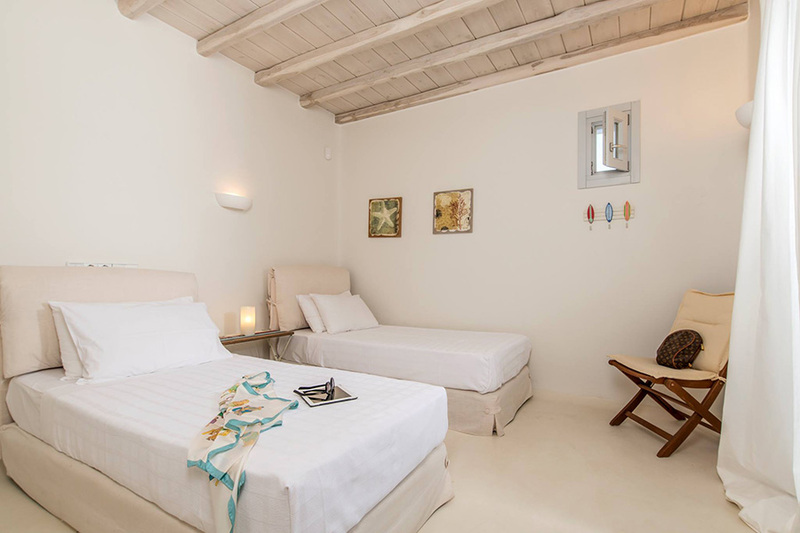 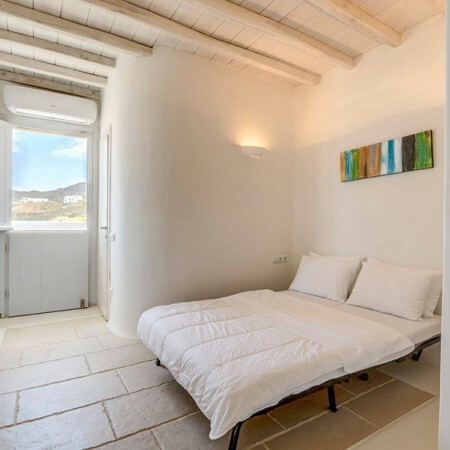 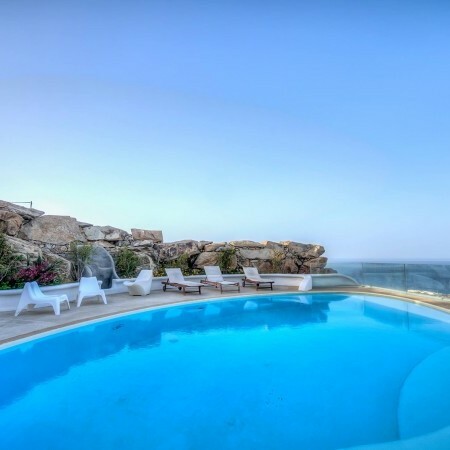 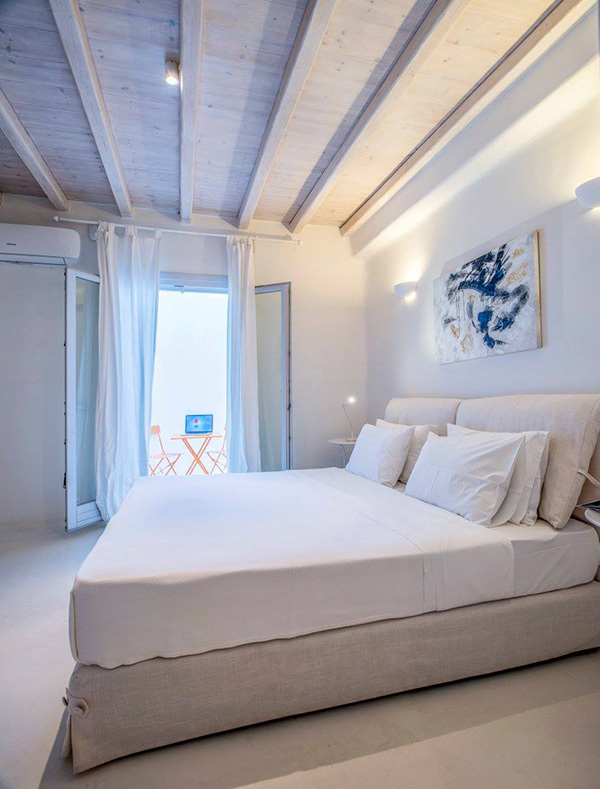 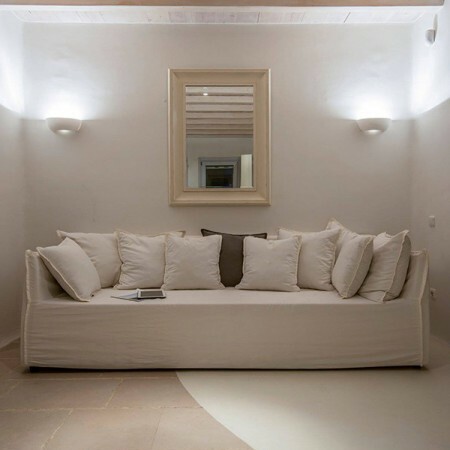 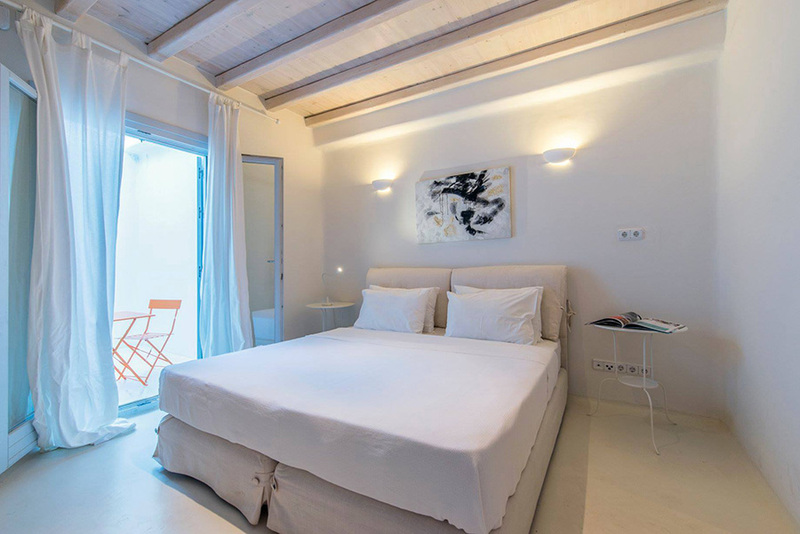 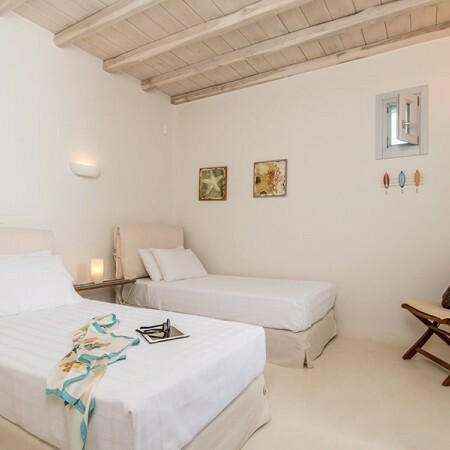 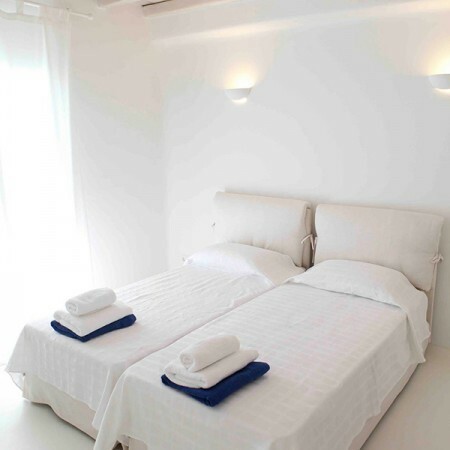 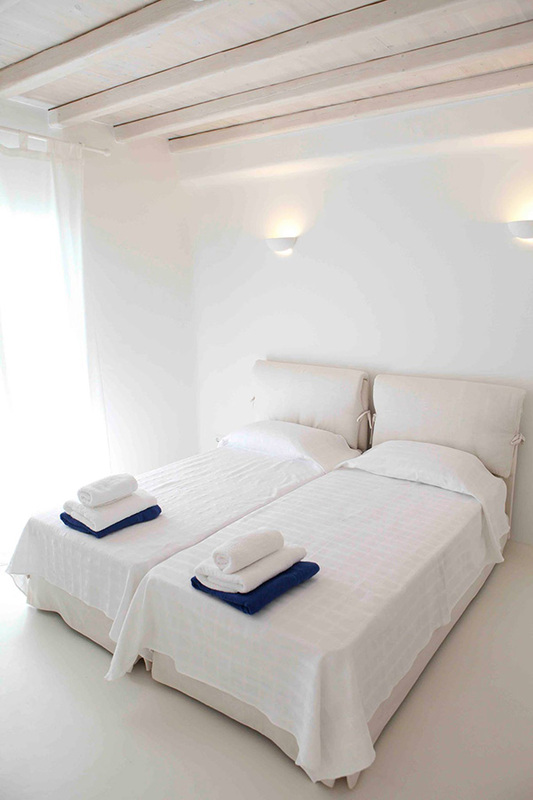 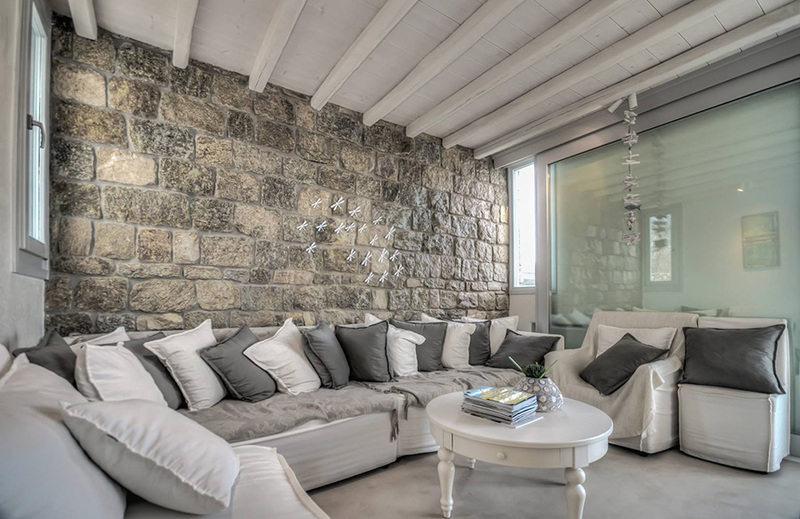 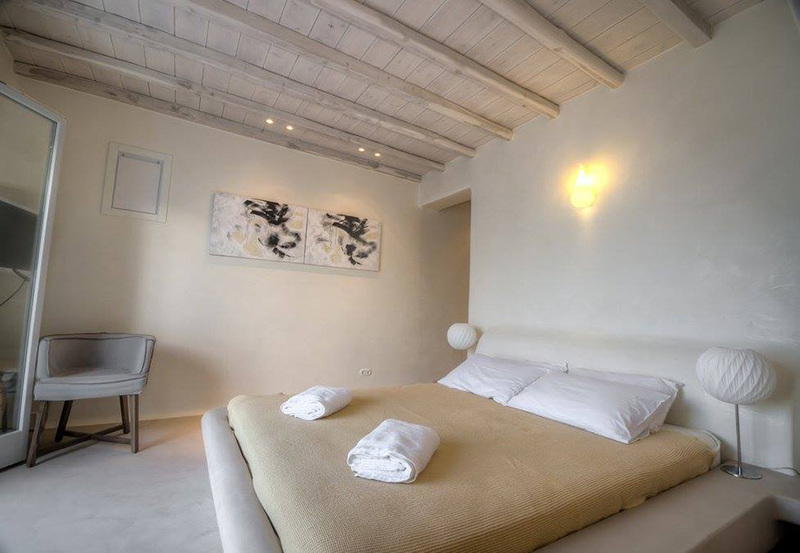 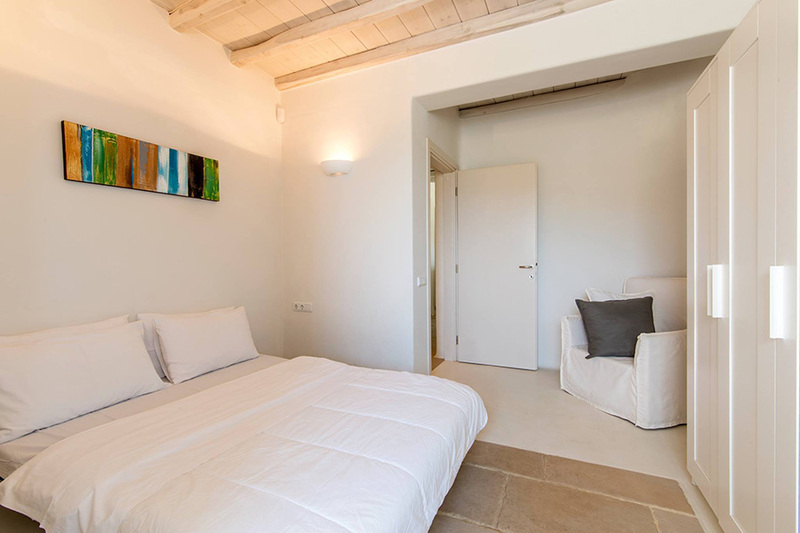 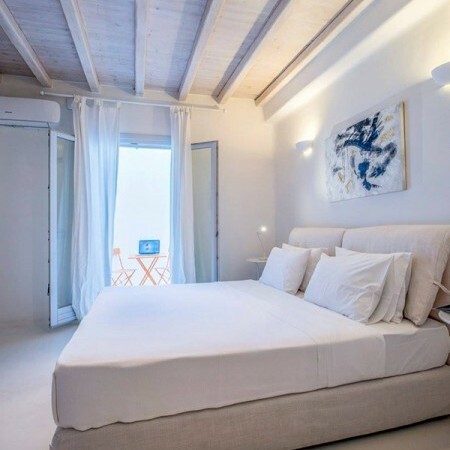 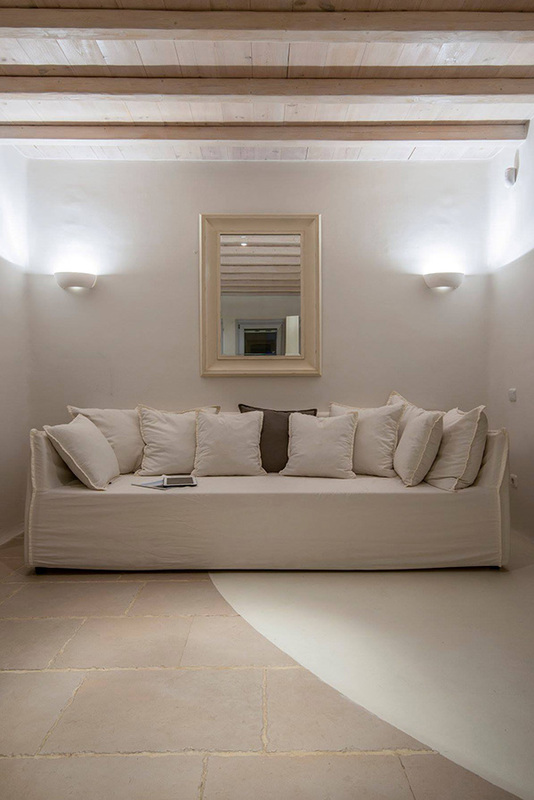 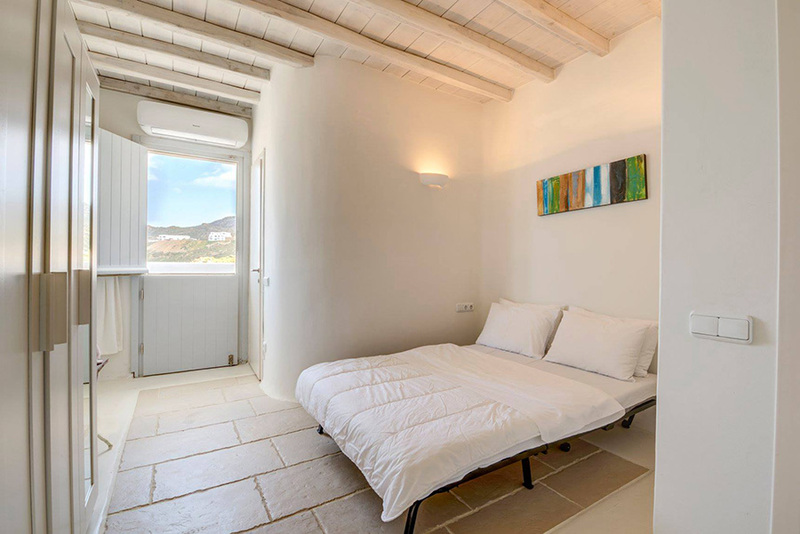 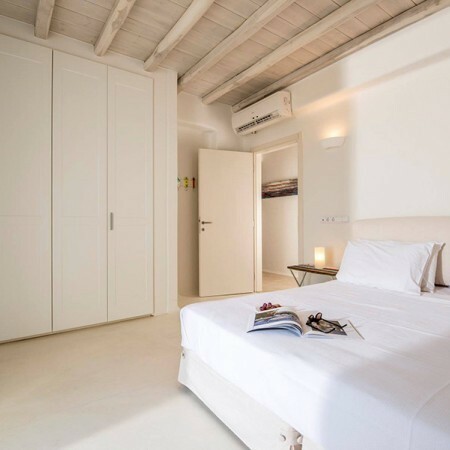 Villa Nissi has a numerous favorite spots on the outside as well as inside. 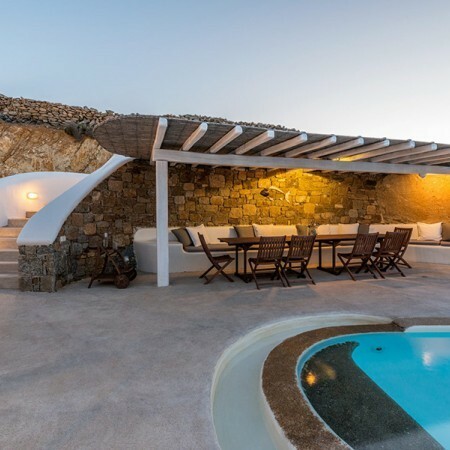 You will find comfortable lounge areas to enjoy a refreshing cocktail facing the island sun or nice and shaded corners to feel lazy after a powerful workout. 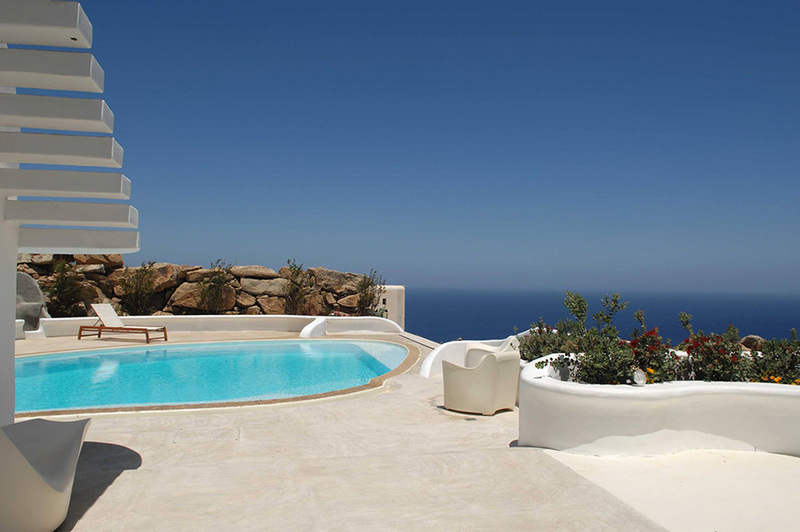 The villa is built within the small community of Fanari area. 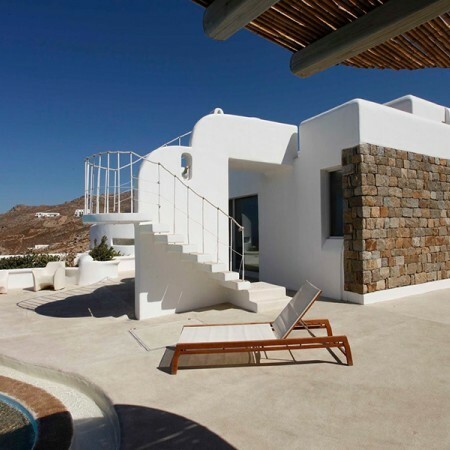 However, its privileged proximity to other houses offers both privacy and independency. 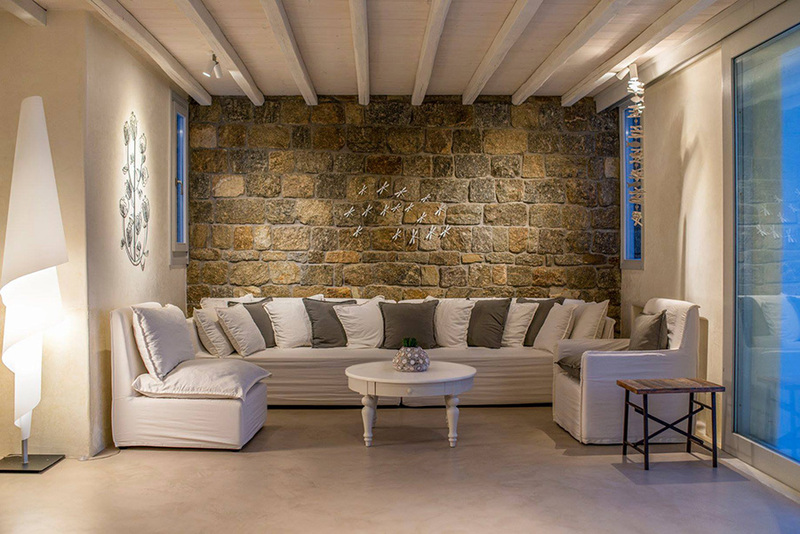 Guests can enjoy a private event or party having nothing to worry about.